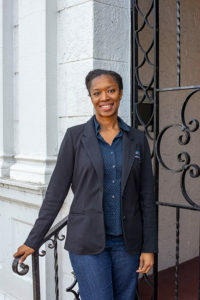 Fort Pierce native Caleta Scott grew up in Miami and worked in Atlanta for several years after college, but now she’s back in her hometown working on behalf of the Lincoln Park neighborhood she loves. Scott, 40, serves as Lincoln Park revitalization coordinator with the City of Fort Pierce grants administration division. She’s helping city officials find grants to boost the economy of the historic African-American community in northwest Fort Pierce. Even though Scott and her parents, Karen and Ronald Scott, moved to Miami after she was born in 1978, she has deep roots in Lincoln Park. Her great-grandmother, Bernice Jenkins, worked as the first cafeteria manager at the old Lincoln Park High School, starting in 1950. Scott lives in the house Jenkins built in the 1950s. “I live in the heart of Lincoln Park, off Avenue D at 29th Street,” she says. When Scott was a child, she often visited relatives in Fort Pierce during the summer and has fond memories of those early years, when she always had sand in her shoes. When she was in high school in Miami, she says her parents threatened to move her back to Fort Pierce. They had graduated from Fort Pierce Central High School, so Scott countered by saying she would have to attend arch-rival Westwood High School, and that settled that. 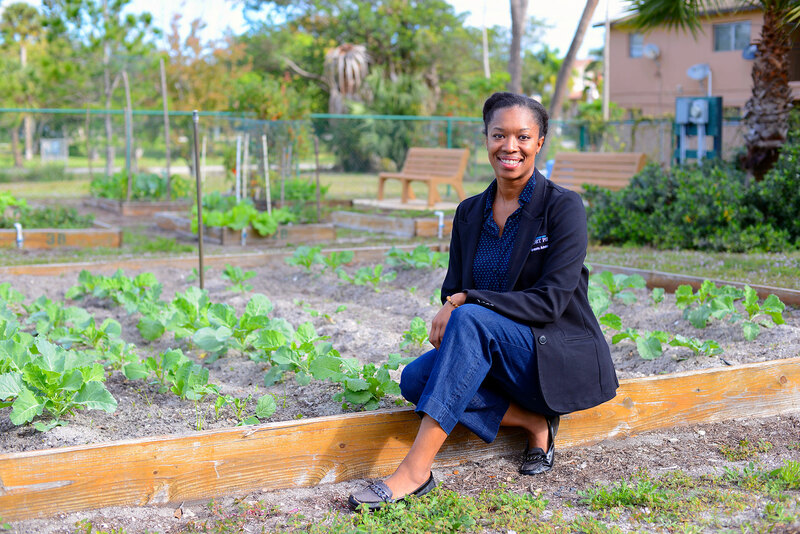 She thinks staying in Miami through high school gave her a broader outlook on life than she would have had in Fort Pierce. After graduating from the University of Florida in 2000, Scott moved to Atlanta, where she worked in sales and operations management in the private sector. Then, when her daughter graduated from high school there in 2015, she was ready for a change. She learned about the job opening in Fort Pierce, got the job and made the move. She says one of the biggest issues in Lincoln Park is the scarcity of quality food that is readily available to residents, some of whom don’t have a way to get to a supermarket outside the neighborhood. For kids, she says, options are limited for buying healthy snacks after school. “There could be just one corner store between their school and their home, and in that corner store all they’re going to get is potato chips, and they’re going to see beer and wine and cigarettes, and they’re going to see a lot of people hanging around, and I think that’s some of the problem,” she says. She hopes to ease Lincoln Park’s “food desert” by enticing quality stores such as Aldi’s to place stores in the neighborhood, and by creating community gardens where residents can plant and harvest their own vegetables and fruit. “We have a community garden at North 9th Street,” she notes. Scott is working with neighborhood partners to establish other community gardens, including one at the Multicultural Resource Center on 23rd Street and Avenue B.
Scott is also focused on the problem of substandard housing. She works closely with the Allegany Franciscan Ministry, a Catholic social welfare group that has targeted Lincoln Park and two communities in Miami and the Tampa Bay area for its Common Good Initiative, which promotes healthier, safer and more prosperous places. The Franciscan Sisters of Allegany, founded in 1859 in the State of New York, came to Florida in the late 1920s to run hospitals, including St. Mary’s in West Palm Beach and the nearby Pine Ridge Hospital for black patients. The sisters eventually were successful in integrating St. Mary’s. In the 1990s, the ministries group was organized to support the needy in three regions — Miami-Dade County, Tampa Bay and St. Lucie, Martin and Palm Beach counties. It has since awarded $92.2 million to more than 1,550 organizations, including about $2 million to Lincoln Park since 2017. Scott, a Fort Pierce native who grew up in Miami and lived in Atlanta, says small-town life is for her. In the past two years, the Fort Pierce grants department has also invested nearly $200,000 in repairs to 31 homes in Lincoln Park. Scott’s office is planning to set up a community land trust that would help low- and moderate-income families buy homes. She sees Lincoln Park as a rich historical and cultural resource, having been the home of celebrated author Zora Neale Hurston and the Highwaymen landscape painters. She says all of Fort Pierce will benefit from higher property values in Lincoln Park. Scott serves on the Martin Luther King Jr. Commemorative Committee, which is raising funds to restore and reopen the Lincoln Theatre on Avenue D. The historic theater, one of only four in the country owned by African-Americans, could once again become the neighborhood’s main entertainment venue, she says. In fact, Scott sees all of Avenue D as becoming a true Main Street, a retail thoroughfare lined with busy shops and restaurants. After experiencing Miami and Atlanta, Scott says she’s happy with small-town life. She loves the fact that the beach is just a 10-minute drive from her home.